Updated to conform to Mathematica (R) 7.0, Introduction to Probability with Mathematica (R), Second Edition continues to show students how to easily create simulations from templates and solve problems using Mathematica. It provides a real understanding of probabilistic modeling and the analysis of data and encourages the application of these ideas to practical problems. The accompanying CD-ROM offers instructors the option of creating class notes, demonstrations, and projects. After covering topics in discrete probability, the text presents a fairly standard treatment of common discrete distributions. It then transitions to continuous probability and continuous distributions, including normal, bivariate normal, gamma, and chi-square distributions. The author goes on to examine the history of probability, the laws of large numbers, and the central limit theorem. The final chapter explores stochastic processes and applications, ideal for students in operations research and finance. If you own the first edition, you will be very pleased with the second edition. It is more complete, better organized, and even more well-presented. If you don't own the first edition, and are looking for an effective tool for conveying probabilistic concepts, Hastings' book should certainly be one you consider. Introduction to Probability with Mathematica adds computational exercises to the traditional undergraduate probability curriculum without cutting out theory. 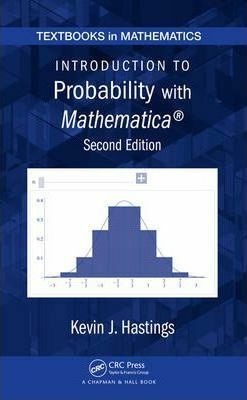 ... a good textbook for a class with a strong emphasis on hands-on experience with probability. ... One interesting feature of the book is that each set of exercises includes a few problems taken from actuarial exams. No doubt this will comfort students who are taking a probability course in hopes that it will prepare them for an actuarial exam. Another interesting feature is the discussion of the Central Limit Theorem. The book goes into an interesting discussion of the history of the theorem ... .
Kevin J. Hastings is a professor of mathematics at Knox College in Galesburg, Illinois.